Medieval England’s specific political and linguistic history encompasses a great number of significant changes, some of the most disruptive of which were occasioned by the Norman Conquest. The alliterative proverb, with roots in Old English and continued vitality in Middle English, serves as a unique verbal icon allowing exploration of cultural conditions both before and after the Conquest. As a durable yet flexible form, the proverb remained just as important in the fifteenth century as it was in the sixth. The proverb has been an underutilized resource in tracing the linguistic and intellectual cultures of the past. Making the fullest use of this material, this study, by Susan E. Deskis, is complex in its combination of philology, paroemiology, literary history, and sociolinguistics, ultimately reaching conclusions that are enlightening for both the literary and linguistic histories of medieval England. In the language ecology of England from about 1100 to about 1500, where English, French, and Latin compete for use, alliterative proverbs are marked not only by the choice of English as the language of expression but also because alliteration in Middle English connotes a conscious connection to the past. 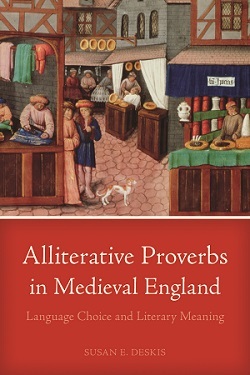 Alliterative Proverbs in Medieval England: Language Choice and Literary Meaning explores how that connection is exploited in various literary genres from school texts and sermons to romances and cycle plays. Susan E. Deskis is Associate Professor of English at Northern Illinois University.